Sunset anomaly caused by sun storm? 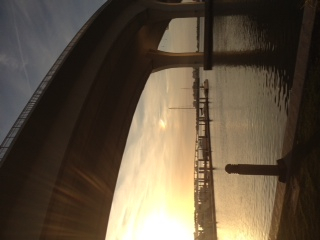 Today, Tuesday January 24th, I went to my local Clearwater beach marina to take a video for a school project. I stayed there for about an hour and at about 5:30 EST I just happened to notice this very odd reflection in the sky. Something I have never seen before and Id love to know what it was. My initial reaction was that maybe it had something to do with the recent sun storm after reading it would hit the earths magnetic field today. It be great to get some info and opinions and maybe another place for me to ask questions. Re: Sunset anomaly caused by sun storm? Much closer to home--those are "sun dogs", caused by refraction through ice crystals in the high clouds above. There can be one on each side of the sun, at the same distance away from it, if conditions are the same in each part of the sky. It is a remarkable sight, but not altogether uncommon. Your photographs were striking, by the way! 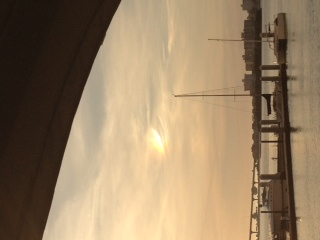 You probably saw what's commonly called a "Sun Dog". That site has info about the many fascinating things that happen when light interacts with ice, water or dust. If it wasn't a Sun Dog you'll still likely find it on that site. Wow, to me that's pretty fascinating. Thanks so much for the info.